Michael Jordan may have helped the Chicago Bulls to 6 NBA titles… but he’s hurting their Social Media Engagement! Michael Jordan, the NBA’s best player yet, was a machine. Averaging 30 points per game in his career, and bringing 6 National titles to the Chicago Bulls, this phenomenon is praised in Chicago almost as a god of basketball. Despite currently being in the playoffs, the Chicago Bulls PTAT% (People talking about them) on Facebook is still only at 2.5%. The average PTAT% for teams in the playoffs is 6.18%. 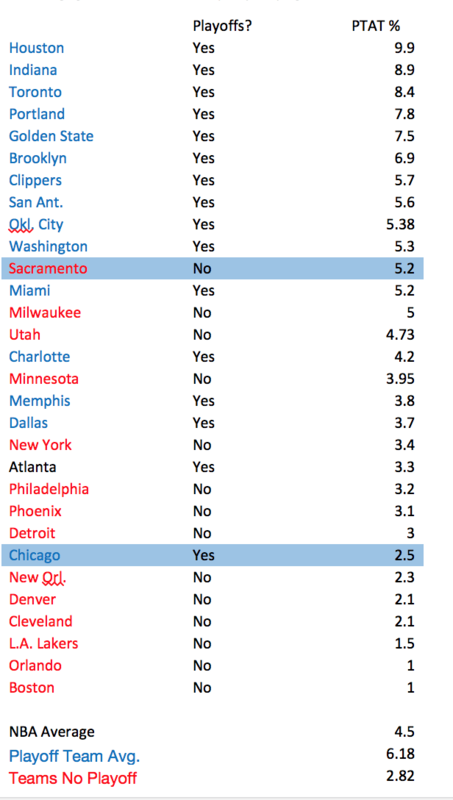 Why is it that the Chicago Bulls PTAT is so low? One main reason may be that Chicago’s fan base is not loyal and true fans to the Chicago Bulls, but they are to Michael Jordan. 69% of Bulls fans also like Michael Jordan. Most of these fans are dormant. This doesn’t help the Bulls at all. In fact, it’s very difficult to engage these fans with their current team. If the only reason a fan liked the Bulls was because of Michael Jordan, then they’re prone to not have actual team engagement. The Bulls need to find a way to engage their fans. Should the Bulls post more pictures of Michael Jordan on their newsfeed? These posts may drive engagement, but still won’t be valuable content to the Bulls organization. I think the Bulls need to compare their current team with team’s back in the 80’s and 90’s era. This will drive engagement with both current Bulls fans and those dormant Michael Jordan fans. Have past All-Star players brought down NBA teams engagement? This may prove it has. NBA Fans are Getting Excited for the Playoffs! Today was the first day of the NBA playoffs. I thought it would be interesting to see which teams fans are most excited and engaged in today’s match-ups. 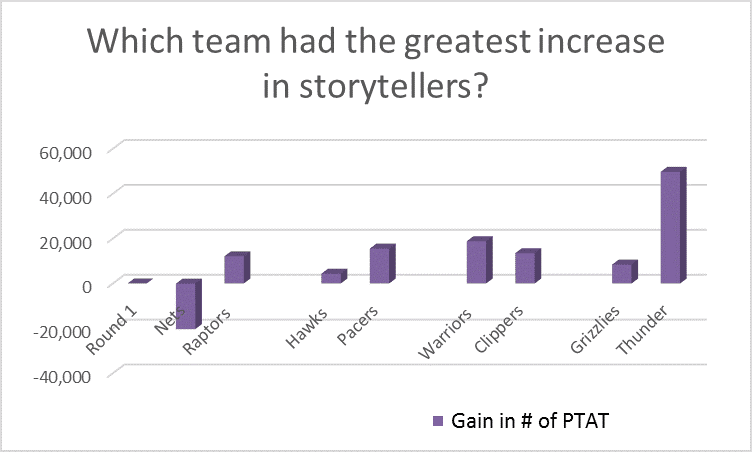 We found the difference between the team’s PTAT% (People talking about This, also known as 7 day storytellers) on Facebook from Friday (4/18) to today (4/19). Monitoring PTAT changes over just one day can be noisy. 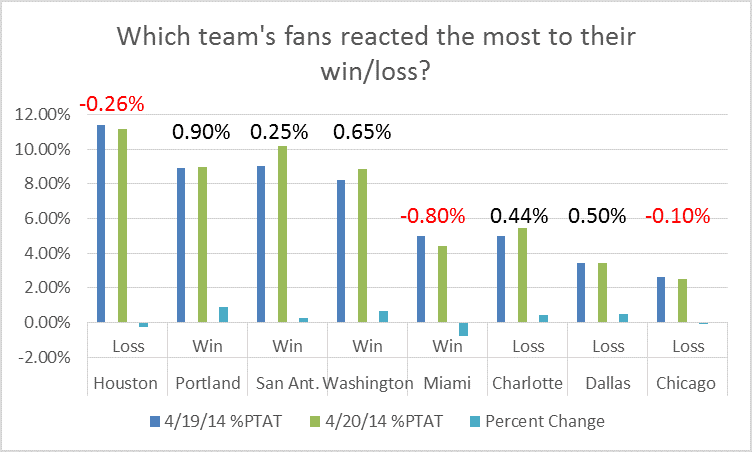 However, the PTAT bump from the regular season to the playoffs is big enough to overcome these fluctuations. 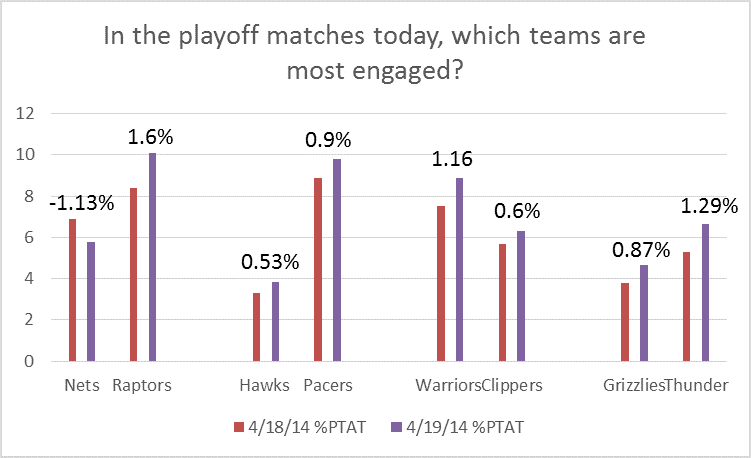 Every team had an increase in PTAT% except the Brooklyn Nets, who actually lost engagement. Toronto had the highest percent increase at 1.6%, which represents 12,000 more active storytellers. Oklahoma City’s 1.29% increase from yesterday to today might not seem impressive. Yet on a gross basis this represents an additional 50,000 active users. The more fans a team has, the more active users you need to make a 1% difference in your engagement rate. Although the Raptors had the highest percent change, they didn’t have the highest amount gross of engagement. They’re actually right in the middle. This shows that the more fans you have, the harder it is to raise your %PTAT. This is the paradox of popularity. The larger the fan base, the lower the engagement. We’ve measured this to be true not just across professional sports, but CPG, banking, retail, and every other category. There is a strong negative correlation between fan base size and engagement rates. So why did Brooklyn’s PTAT decline by 20,000 fans? They lost their last 2 games of the regular season. Fans of losing teams are quiet compared to teams that win, as we demonstrate here. Facebook is taking away the PTAT metric soon, so this is a good opportunity to get the most you can. We don’t know what the new metric is, but it probably breaks out engagement by type, instead of rolling it into a single number that treat all engagement with the same weighting. Perhaps LCS (likes, comments, shares) will be separate. Coming tomorrow is the rest of the pack! We’re going to analyze the rest of the team’s in the Playoffs that play tomorrow.